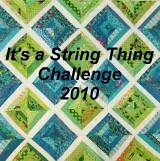 I just finished my Quilt for Kids and am ready to start finding "strings" for my string quilt project. I will be making rectangle shaped blocks and I'm going to use black in the middle of each one. I haven't tried this yet, but in pictures I've seen it really changes the look of the finished quilt. Wish me luck because my center strip may not be in the center once the block is squared up. Also wish me luck in keeping up because my mind is always thinking up new things to start instead of urging me to finish what is already started. Anyone else share this affliction? I hadn't thought of making a blue and white quilt to commemerate this cold and snowy winter-but it sure is a good idea! I'll be watching the Orange Bowl tonight and maybe sorting scraps at the same time. University of Iowa is playing. New Years Eve Iowa State University (my Alma Mater) played in the Insight Bowl. Two Iowa teams in Bowl games in year! Life is good! How do you decide? How many fabrics do you use? I posted my first string quilt top on my blog. I think I need more blocks. Sometimes I look at a color wheel to see what looks nice together and sometimes is just because we have hugh over-abundance of certain colors around here. Pink always seem to be in abundance. I just use two different colors with my color controlled quilts. I pick out my strings for each side from the same color family. There will be different shades let's say of blues on one side and greens on the other. Don't worry about throwing in a novelty or two. That gives it some character and you will also use up more fabrics from your stash.